Boss Polish Cloth The BDC-01 removes dirt, dust, smudges, and fingerprints from instruments and g..
Boss guitar Detailer BGD-01 is the safe solution to clean, shine, and maintain all types of guita..
Dunlop Bodygloss Cream of Carnuaba The highest-grade carnauba wax, in a proprietary formula. Poli..
Dunlop Fingerboard Cleaner Perfectly balanced for fingerboard woods and fret metals. Removes buil..
Ultraglide 65 String Conditioner Shields strings against tarnish and corrosion, extending their p..
Dunlop Micro Fine Fret Polishing Cloth Micro Fine Fret Polishing Cloth will polish your fret..
Dunlop Deep Conditioner Prevents warping and cracking while replenishing the proper oil balance o..
Dunlop Lemon Oil Ultimate Lemon Oil will remove grime and return your fretboard to its original l..
Dunlop Guitar Finish Cloth Using a formulation that was originally developed for jewelers, o..
Dunlop Polish Cloth 100% soft lint-free cotton flannel. Nontreated material. Perfect for applying..
Dunlop Polish No 65 Cleans totally and quickly. Restores any finish to its original luster. 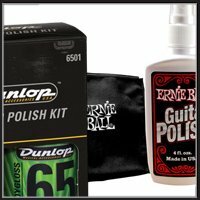 Leave..
Dunlop Polish No 6516 Dunlop Manufacturing Dunlop Formula 65 Guitar Polish & Cleaner 6516 Gui..
POLISH CLOTH 14 x 14-inch gray Microfiber polish cloth with stitched edging. Washable. ..
FAST-FRET Not a spray! Contains no silicone. It's a liquid in an applicator. Use it on your s..